Designed for use with the 7611 F.A.Q. Cleaning Solution. 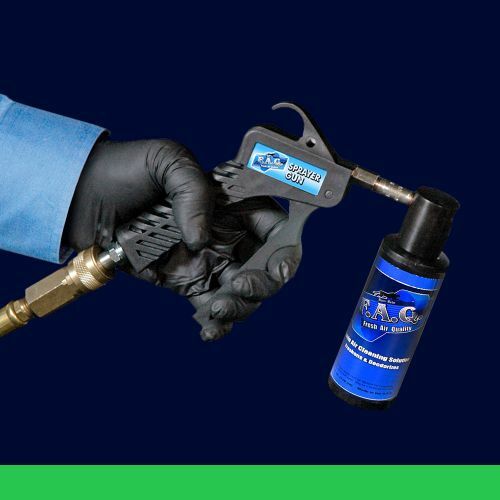 This spray gun attaches to an air hose to rapidly atomize and distribute the F.A.Q. Cleaning Solution. The F.A.Q. Spray Gun quickly and easily attaches to a shop air hose on one end, and to a bottle of 7611 F.A.Q. Cleaning Solution on the other end. The technician can then pull the trigger and the gun will atomize the cleaner into mist spray. With the vehicle running, the technician can then easily aim the spray to all areas of the exterior cabin air intake vents and then turn his attention to the interior vents. After spot treating any problem areas of the interior, he simply stands outside the vehicle while reaching inside the car and aiming the spray gun towards the interior intake vent, until the cleaning solution bottle is empty. This process is very fast, easy and highly effective! It can quickly and safely help to eliminate mold, mildew, bacteria, viruses (including ebola, H1N1 or swine flu) and other allegens on contact! Click on the "Additional Information" tab to read more about the benefits of F.A.Q.